This is the first issue of 2013 and it’s already one of our best issues to date. 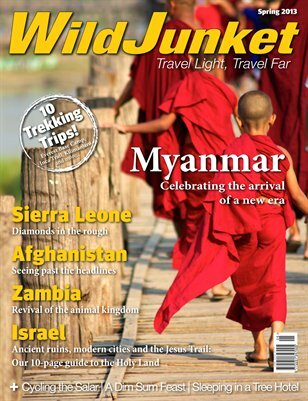 We’ve packed in compelling stories from some of the most interesting corners of the world including a cover feature on Burma, a photo essay of Sierra Leone, and a 10-page comprehensive guide of the Holy Land, Israel. In our Under the Radar section, we see past the headlines and venture into the forbidden territory of Afghanistan with contributor Stephen Lioy. For a meal that not only satisfies our appetite for our thirst for adventure, writer Noah Lederman navigates the dim sum jungle of Hong Kong and brings us on a thrilling ride. Talented wildlife photographer and writer Dale Morris opens our eyes to an unknown safari destination in Zambia.